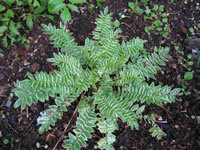 of bright green or variegated, fern-like foliage. Jacob's Ladder plants go completely dormant in the winter but quickly re-emerge in early spring, and will be in full bloom by early summer, producing loose clusters of tubular or bell shaped flowers that are most often sky blue in color. 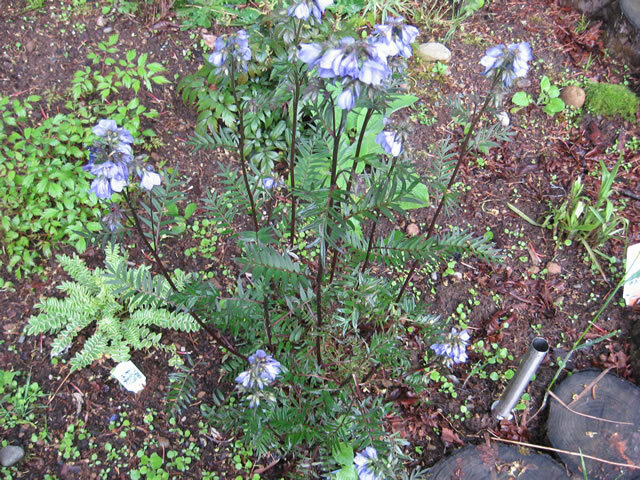 Polemonium boreale is a low growing, dwarf species that is native to areas near the Arctic Circle. Small purple or blue flowers on top of 3"-12" stems in late spring. 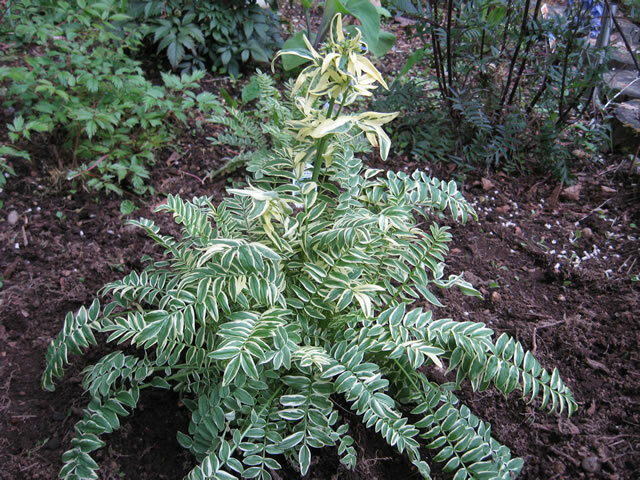 Polemonium caeruleum 'Brise_d'Anjou' have brightly variegated foliage that will reach 24" tall, forming tight 12"-18" clumps. Produces pretty, violet-blue flowers from late spring until mid summer. Jacob's Ladders prefer cool conditions. They should be planted 12"-18" apart in compost rich, well draining soil. 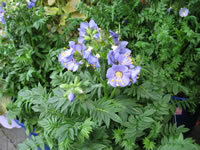 The variegated forms of Polemonium should only be grown where they will receive partial to full shade in the afternoon, to protect the foliage from sun burning. Cultivars with darker foliage can tolerate more full sun. Water regularly and thoroughly. Jacob's Ladder plants will languish in drought conditions or during periods of high temperatures. 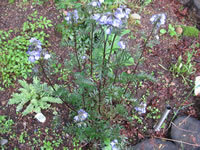 When your Jacob's Ladder finishes flowering, cut the plant back hard to induce new foliage growth. For some reason, cats seem to be drawn to Polemonium plants like catnip. Precautions should be taken to protect your Jacob's Ladder from your feline friends. Jacob's Ladder plants can be propagated with cuttings, division or seeds. Softwood tip cuttings should be struck from young shoots in the spring months. Established clumps should be divided and replanted every 3-4 years. Seeds can be sown directly into the garden in late fall or early spring. Fall planted seeds will germinate early in the following spring. 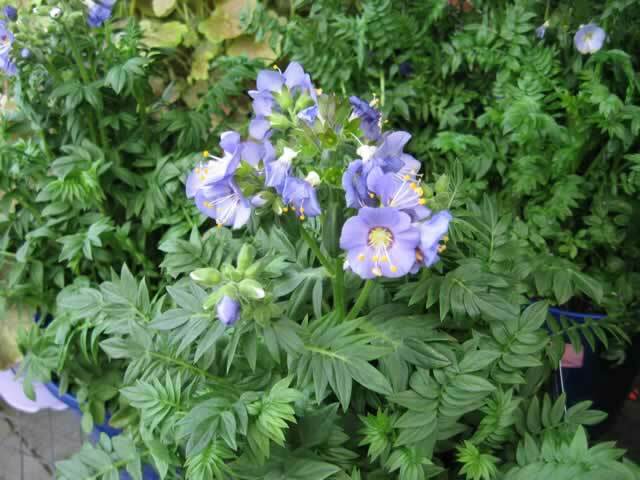 Polemonium seeds can be started indoors at any time. Maintain a temperature of 70° in the growing medium during germination which will take from 20-25 days.